What is net metering? Net metering refers to an electric meter located at a home or business that tracks both the electricity that flows into the building from the local grid and the electricity that flows out of the building to the local grid when an on-site power generation system is producing more power than the building is using. Net meters determine the “net usage” of a customer by tracking what their on-site power system produces and provides back to the grid, as well as what the customer uses each billing period. Controls energy costs: Since net metering systems are designed to meet all or part of a customer’s needs, the customer can reduce their energy costs and more easily predict how much their electric bills will be each month. Excess power credits earned for what customers don’t use: If a net metering customer produces more electricity than what they use in a certain month, they are credited for the excess power they’ve provided back to the local grid. At the end of a 12-month period, net metering customers either pay the balance of what they owe for their net usage or are credited or paid by the utility for the net excess power that their system delivered back to the grid. Can increase power quality and reliability: Some net metered systems can operate even through a blackout. As such, these systems can ensure a steady supply of power, and this is particularly true if the customer is also using other tools such as battery storage and/or backup emergency generation. Improves efficiency of power production and delivery: Net metering policies encourage electricity to be generated near where it will be consumed, which diminishes the amount of electricity lost via heat energy when power has to be transmitted across miles and miles of wires. Helps reduce strain on the grid: Particularly when it comes to rooftop solar net metered systems, excess power is being produced right when the electric grid needs it most — during hot, sunny days. This is when air conditioning units are working overtime, and the grid is being taxed with high demand. If the utility can anticipate a smoother demand curve on such days, due to some of the demand being met by onsite generation, utilities may be able to more easily manage the grid during times of peak demand. Reduces a utility’s overall system costs: On-site generation systems provide energy and capacity to the customer and the local distribution grid, ensuring that the utility does not have to procure it elsewhere. This means less electricity that the utilities have to push out over their transmission and distribution system, reducing wear and tear on the wires, substations, and other infrastructure, thereby reducing the overall costs of procuring, delivering, and maintaining the grid. Reduces reliance on fossil fuels: Net metered systems offset a customer’s demand for grid-provided power, which is still heavily reliant on centralized power stations — commonly coal, nuclear, and natural gas plants. The more that customers take advantage of net metering policies, the faster we will transition away from polluting and aging power stations. 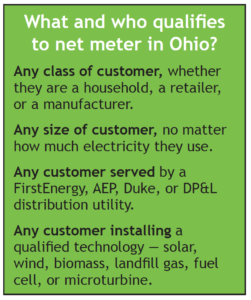 Encourages the deployment of clean, renewable power: Net metering policies send a clear signal to customers and project developers that Ohio is a welcoming state for new job creation, for new projects, and for empowered customers to take more control over where their electricity comes from. Additionally, rooftop solar installation is one of the largest clean energy job sectors in the region and is rapidly growing. While Ohio has decent net metering rules to support self-generating customers’ ability to receive credit for electricity they supply back onto the local grid, they are outdated and not on pace with market trends. That said, net metering is under attack across the country, and Ohio is no exception. In November 2017, the Public Utilities Commission of Ohio revised rules on net metering. If they are allowed to go into effect, the new rules could impact what an electricity provider credits to customers when the customer’s net metered system produces excess power back to the grid. Specifically, the PUCO ordered that the net metering credit be calculated for its energy value only, and prohibited the capacity value from being included in the credit. Net metered customers should be compensated for all of the benefits those systems provide to the grid–both for the electricity AND capacity values. Additionally, the proposed changes would prevent you as customer from receiving a refund for these accumulated credits and undermine your ability to choose a new provider for the power you buy from the grid. The OEC, along with other key consumer advocacy stakeholders, believe these changes are unfair for you, and will benefit your electric utility way more than you as a net metered customer. 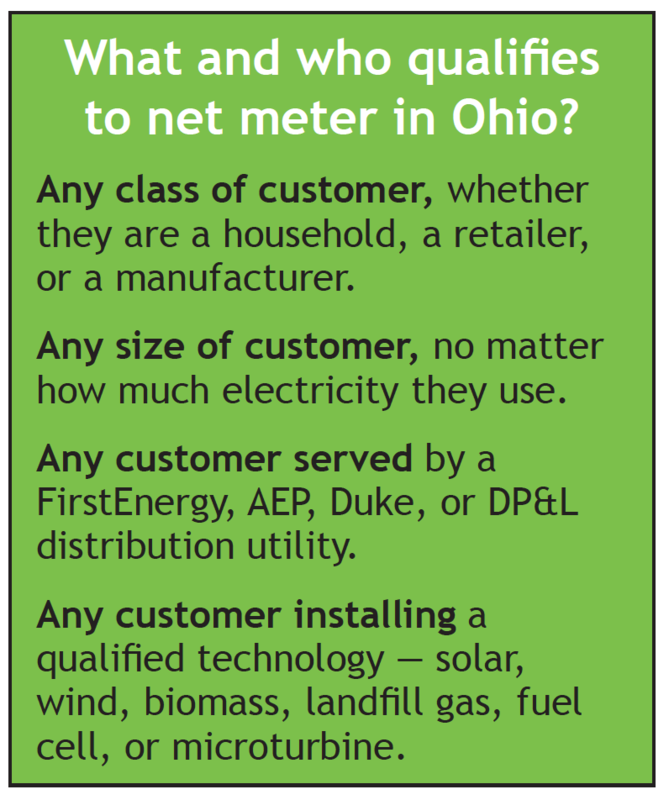 The Ohio Environmental Council believes it’s time to stop attacking distributed generation systems and net metered customers, and recognize the full value that distributed generation systems are providing to our grid across the state. While it may be true that distribution utilities, nor the PUCO, have established a standardized monetary value for the capacity that distributed energy resources provide, it is well-established that these systems provide some capacity value and customers should be compensated for that value provided to the grid. You can express your support for properly compensating net metering customer by sending a message to the PUCO! Follow this link to send a message: http://bit.ly/solardefend.